Add to Cart –> Enter Billing Details –> Pay –> Download. Download links will be made available immediately after the payment. Downloads and updates are accessible for up to Two Years from the date of purchase. Geography (2019) notes are updated till Indian Geography. Remaining portions will be updated soon. 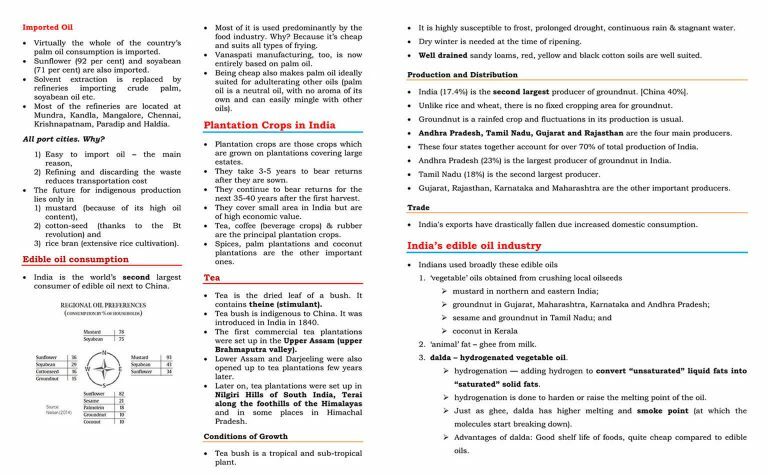 Users that purchase the Geography notes today will get the remaining portions at no extra cost. 24/01/2019: Geomorphology uploaded on PMF STORE. 22/02/2019: Climatology uploaded on PMF STORE. 26/02/2019: Oceanography uploaded on PMF STORE. 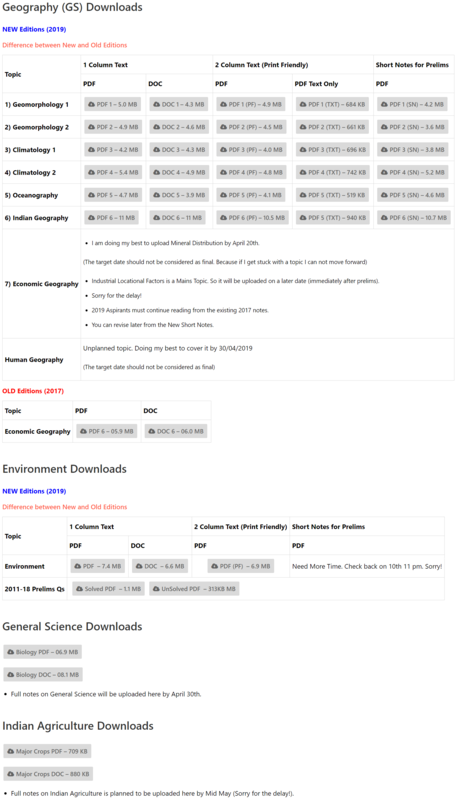 30/03/2019: Indian Geography uploaded on PMF STORE. Planned release date of Mineral Distribution (Economic Geography) is 20/04/2019. Industrial Locational Factors (Economic Geography) is a Mains Topic. So it will be uploaded on a later date (immediately after prelims). All existing notes will be updated by May 2019 Geography notes are updated till Indian Geography. Remaining portions will be updated soon. Change in pricing is necessary for Sustainability and Better Service. How to approach this notes? You must first analyse the previous years’ prelims and mains papers to understand the pattern and nature of questions asked from Geography. Use DOC file to make short notes for quick revision for both Prelims and Mains. This way you can save a lot of time. UPSC is changing the nature of the questions from year to year. There is no fixed rule. Future question papers can have predominantly Static or Dynamic knowledge-based questions or a mix of both. Don’t take chances, cover both. You must also focus on Environment related concepts like pollution, climate change, etc. from our Environment notes. Are these notes useful for Geography Optional? Yes, it can be quite useful for creating a good base for Geography Optional. 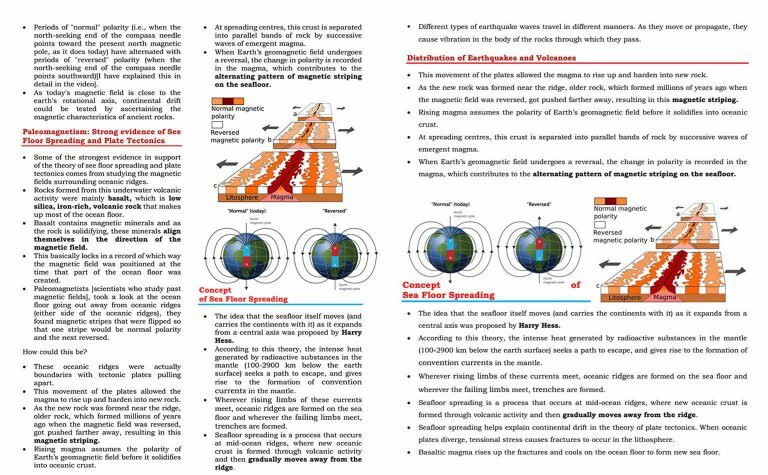 Basics are the key to quickly grasp Physical Geography concepts. It’s really good. It covers most of the topics of geography. Thank you for your review Pradeep. Good luck! Great book explained in details provided sufficient informations required with concepts. Can look for updating new concepts relevant for mains and optional something related to current affairs periodically. For eg like Indian dipole was something in news was asked in prelims related to ENSO concept. Keep updating and mail it to the loyal customers. Thank you so much for your comprehensive review and wishes. I had plans to provide related current affairs but due to lack of time and other commitments I couldn’t. I will try to do it for CSE 2018. Thanks Arvind for making time to review. All the best! I really enjoyed studying from these notes. The pictures make it very easy to grasp. The climatology part, especially the Indian monsoon section, was extremely helpful. I recommend this to all serious UPSC aspirants. Thank you so much for your comprehensive review Saumya. Good luck! It is a wonderful book to cover all sections of Geography. Thank you so much for your review Prashant. Good luck! One word just awsmmm!!! notes. One stop solution for such vast geography. It was immensely helpful in my preparation. Thanks for these wonderful notes…. Thank you for sharing your thoughts Rahul. Good luck! Handy, Precise and upto the mark. I think, it is a good, crisp and simple notes. No need to study more Savinder Singh and Gc Leong for geography and agriculture portion and especially environmental portion only need to link it with current events. If u further updates its with current event time to time more beneficial us bcoz now a days questions not asked directly static portion so please update time to time. And last thank you so much for providing such an amazing material. Thank you for your review Ranjeet. What you said is right. Questions from Current affairs are getting significant weightage these days. I will think about providing relevent current affairs as well. Thank you so much for your review Manish. I don’t have any notes on ethics. For ethics Manoj K Jha of Ias Score is really good. But his course is pretty expensive (~15k+). You can try getting his printed or hand written notes from Delhi. It is joie de vivre in reading your notes. Helpful not only for competitive exam but also enrich our life with useful and lucid concept of geography which are there but unknown to us. Thanks PMF for sharing your notes. Thank you so much for your review Rohit. Good luck! I am not able to download the notes . Kindly help. Please check your email for the download links. Please use the contact form https://store.pmfias.com/contact for a quicker response. Regards. Economic Geography notes are excellent. Thank you for your review Umang. Good luck! Thank you for your review Athira. Good luck! One of the most informative notes for geography, especially with all the detailed diagrams, maps and statistics and that too at perhaps the most reasonable price. Hope similar initiatives are taken for other subjects in the future. Thank you very much for all the work. Thank you for your comprehensive review Somnath. Will definitely try to bring more useful content. Great effort at a very reasonable cost. 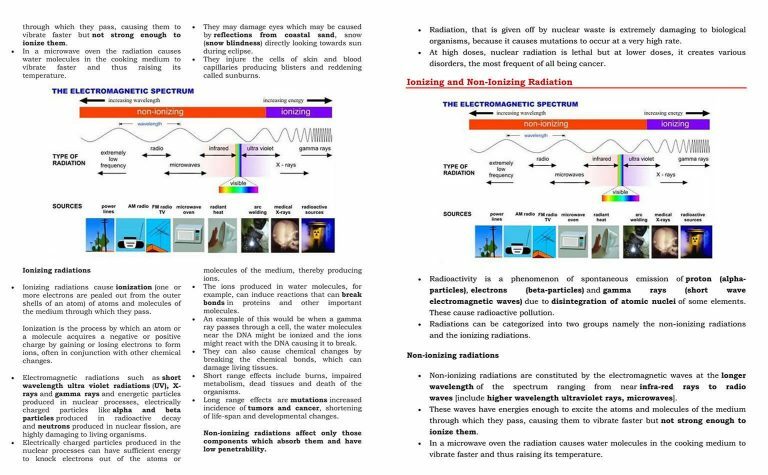 Book is compiled in a very informative way so that the student can derive maximum advantage from prelims point of view. Points are systematically arranged. NCERT’s are very exhaustively covered in a very lucid and easy to understand language. Supporting pictures are of great help. A good book worth buying. Thank you very much for your detailed review Shantanu. Good luck! 2. Notes also have references and answers to some conceptual previous years questions. 3. At times, author also tries to frame possible conceptual question and answers them – It helps expand your horizon of understanding. 4. For many important topics, it provides ‘summary’ and ‘eloboration’ – caters the need of both categories of the person who want brief and detailed study – serves quick revision. 5. Important terms / concept are in bold letters, making them easy to spot and focus during revision. Note : ‘Human Geography’ and ‘Industry Location Factor’ is not covered in these notes. If anyone know what is the best and concise source for this, pl. pl. inform. I wish best of luck to the author for his attempt in CSE. – Coming to ‘Industrial Location Factors’ part you can refer mrunal.org/geography. I didn’t cover this part as I wouldn’t have done it any better than what mrunal has done. Why do the same work twice? – And coming to Human geography part, it is not explicitly mentioned in the GS mains syllabus. And in prelims hardly any questions are asked from Human Geography. But in Geography Optional HG has a determining role. But my notes is meant for GS only! Very well structured and descriptive elucidation of concepts. It explains concepts very lucidly in simple language. I choose this as I liked the pictorial representation of concept. I am using this as my primary material for geography. Thanks for providing this good material at this cost, which is affordable. I have read notes of climatology, Indian Geography and Geomorphology till now and they are really great notes. Follow these notes with pmf videos on youtube as they will help you to understand better and quickly. 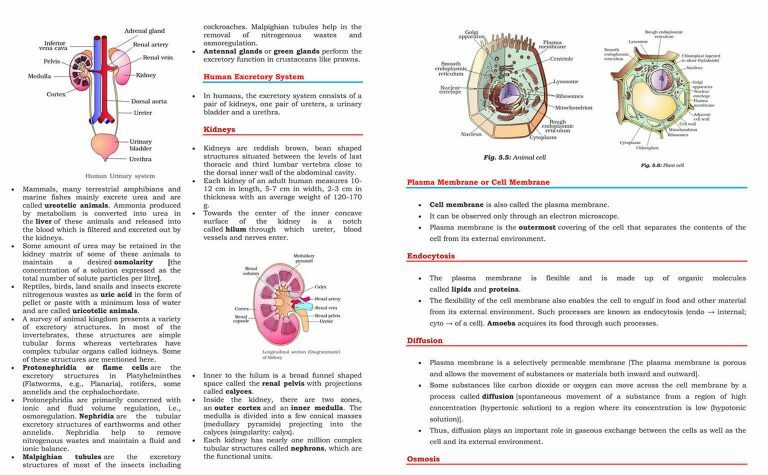 If possible buy the notes as pdf will help you to read easily and allow you to add extra information in notes. Thank you for your review. Good luck with prep! I had started preparing for geo with all ncerts from 6-12. Later when I crosschecked the PYQPs to check my knowledge base I was really disappointed with my progress.Then before reading GC Leong as suggested by everyone I came across this platform and watched some of the videos regarding climatology. Believe me, I couldn’t be more happy to find all my doubts cleared in those videos. Then I went for other videos on various topics and then I was literally ecstatic to find such a wonderful compilation of all necessary concepts needed for upsc prep. This could not be better presented by any other guy or team on any known platform. Moreover when I discovered the notes and that too at such a modest rate, the respect for PMFias became more profound. Trust me geo notes with most of the content copied pasted from many sources are sold in hundreds of rupees in New Delhi bookshops but PMFias notes at such a meager amount is something which deserves accolades from all aspirants. After watching those videos, grasping geo concepts has been like a cakewalk for me. I believe every aspirant who watches even a single video of PMFias should purchase these notes just to pay tribute to the sheer hard work in the compilation of such amazing content. Lastly, thanks a ton for this! God bless you! I can understand your enormous efforts to put up this stuff. thank u broda..!! Thank you Yeseswi for making time to review Geography notes. Happy New Year and Good Luck! Sir thank you very much. Notes are very nice and complete.All the important points of NCERT, Shankar IAS, are there l. So it’s time saving totally. Many additional points are also there which is very useful to understand the concept. After reading one or two times, it feels like, notes are made by self only. Plz update us about the additional notes which you will add in future. Than you for your comprehensive review Atul. I will definitely try to bring more notes. Very comprehensive. It has got everything to help you sail through prelims and mains as far as theoretical geography is concerned. Thank you for your review Ashish. Yes from static perspective of the syllabus it is quite useful. I will think about the dynamic part as well. Thank you Sunil. All the best! Sir please provide human geography notes. I am working on it. It will take time. It won’t be completed anytime soon, at least not before UPSC 2018. One of the best, I appreciate your service and please provide history and economic notes. Thank you very much for making time to review Geography notes. I will try to come up with notes on other subjects as well, but not sure when! superb work… you made geography, very easy. Thank you for your review Aravindan. Good luck!